My Amazon.com review - "Data decorators, data-ink, instant chartjunk, and naked women"
Perhaps the single most accessible book on data visualizations. You are given a tour of the history of visualizations, the seminal contributions of people such as Playfair, Tukey, and others, a rogues' gallery of sorts of awful visualizations, a peek into small-multiples visualizations, and an exposition of the principles of good graphic design and visualizations. A must-have book for anyone interested in good data visualizations. Tufte's contention is that a lack of adequate knowledge and expertise and a mistaken notion about numbers are to blame for bad visualizations. The principles of good visualizations, on the other hand, are few and simple. The book is all about exposing bad examples and enunciating these good principles, beautifully illustrated with examples, and printed on excellent quality paper. Chapter 2, "Graphical Identity" contains a stunning collection of graphs that distort, lie, deceive, and exhibit all manners of skills other than those required for data visualizations. Which leads to his definition of the term, "Lie Factor", which he defines as the "size of the effect shown in graphic" divided by "size of effect in chart". So, it should not come as a surprise, when Tufte takes a single bar with a value label at the top of the bar, and states that "the labeled, shaded bar of the bar chart, for example, unambiguously locates the altitude in size separate ways." [page 96]. Yes: the label, the two vertical lines of the bar, the top line of the bar, the vertical axis marker - all inform us. Chapter 5 - "Charkjunk: Vibrations, Grids, and Ducks" is perhaps the most humorous chapter, a bit sadly so, as the title itself suggests. A quote from Johnathan Swift, indicting 17th-century cartographers, says it all - "With save pictures fill their gaps, And o'er unhabitable downs, Place elephants for want of towns." [page ] ouch! This is a screenshot of the offending graphic, taken from Amazon.com's Look Inside feature. You may not, and I certainly did not agree with Tufte's suggestions for maximizing the data-ink efficiency of the box-plot, in the chapter on "Data-ink Maximization", but they are worth examining nonetheless. 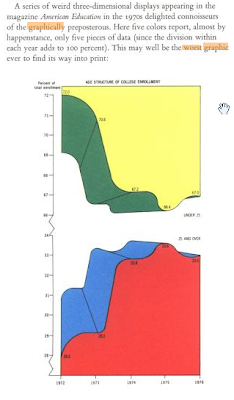 However, his redesign of the bar chart, with a border and other accouterments, on pages 126-128, are excellent. Many examples of bad visualizations cited in the book are from the "New York Times", so it is sort of reassuring when you see that the quality of visualizations on the NYT has improved a lot, and are frequently the objects of animated discussions, and generally well regarded. There may be hope, after all. And what about that slightly inappropriate word in the title of the review? We must be all thankful for small mercies, I suppose. Though there are a depressing number of vendors in the market that make their software such as to manage vulgar visualizations.